PAB Joseph Redmond monitors students from the Mackay Centre School as they roll along the corridor on adapted bikes. 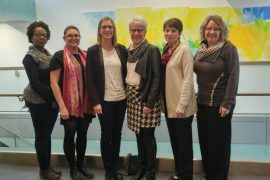 The staff from the Mackay Centre and Philip E. Layton Schools of the English Montreal School Board (EMSB) and the Rehabilitation Program in Specialized Schools (RPSS) team of the MAB-Mackay Rehabilitation Centre moved last fall from the Mackay site to a brand new facility on Terrebonne Street in the NDG neighborhood. Several years in the making, the result is a spacious and light-filled building that meets the needs of students with motor, visual, hearing and language impairments. The Rehabilitation Program in Specialized Schools team are better equipped in this new facility to deliver proper care to their young clients. 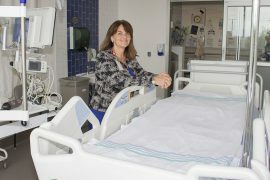 The move involved extensive planning by the staff at MAB-Mackay Rehabilitation, who collaborated with various CIUSSS teams. RPSS Program Manager Alison Leduc and Clinical Coordinator Hema Patel explain the key elements of this historical move and what their team has learned from the experience. 360: Can you describe the move? Alison Leduc: When you consider what a big operation it was, it went well. The schools started with little delay, and our rehabilitation services started on time. It has taken several months to get everything in place so we’re still in the process of settling in. Hema Patel: Our number-one concern with the move was that client services would never be affected by delays or road blocks. The RPSS team really stepped up to ensure client services were never interrupted. Our team is amazing, and we worked in a great partnership with everyone on board to get this done on time and to make it work. 360: How has the new building helped the team improve their services? Hema Patel: We have brand new equipment and the physiotherapy and occupational therapy rooms are more spacious. Another plus is that the building was built to bring in as much natural light as possible. 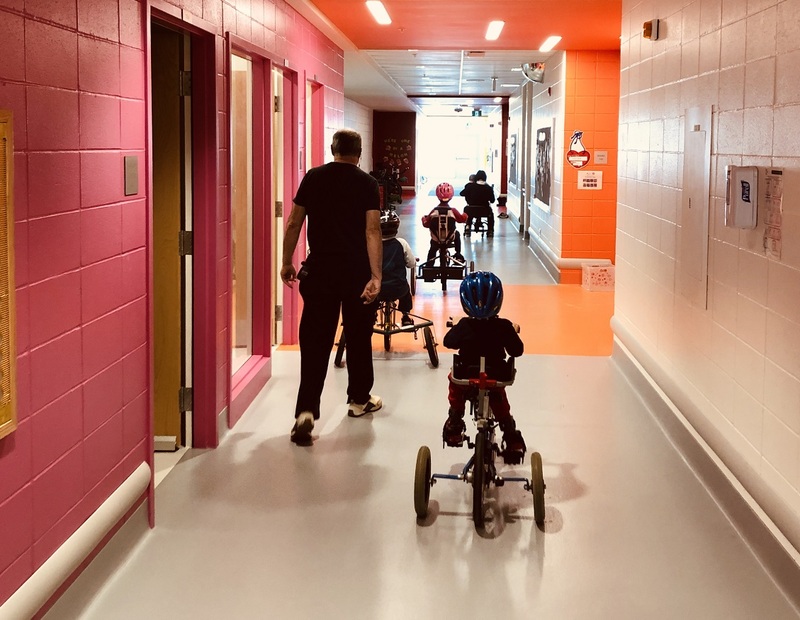 Alison Leduc: We now have ceiling tracks for the lifts for children requiring transfers from their wheelchair to a bed at the nursing stations, making it so much easier to transfer the kids. 360: Have you encountered any challenges along the way? Alison Leduc: We are getting used to little things being different. Now we are in a building that is owned and operated by the EMSB. Hema Patel: We love this new building, but we miss being close to our colleagues. We do make a point of going to the Mackay site as much as we can, but it has been a bit of an adjustment. Most of our specialized clinics continue to be located at the Mackay site, so there is a lot of travelling for the children and their families back and forth from the school and the Mackay site for appointments. 360: Which CIUSSS teams did you work with? Alison Leduc: The Innovation team’s help with the move was invaluable. Élodie Tougas-Leclerc, Administrative Processes Specialist, asked us the right questions, gave us tools to help with planning and logistics, and encouraged us to participate in a risk analysis workshop. She kept us on track, which was the biggest help. Élodie guided us to making sure we were thinking about the right things at the right time. The Nursing Directorate team also counselled us not only on the design of new nursing stations, but also on matters relating to medication management and infection prevention and control. Of course, Information Technology (IT) was heavily involved with the move. It was a big project on their end to coordinate. They had to work not only with a building owned by another organization, but an environment that has two servers, one belonging to the EMSB and the other to the CIUSSS. Ensuring the privacy of our server was paramount. The Purchasing Department needed to create a new site in their system for the schools, so we could proceed with our new orders. The Communications team helped to get the word out for the move both internally and with the public. 360: Much of the Rehabilitation Program in Specialized Schools was at the Mackay site for decades (the RPSS team at the Philip E. Layton School moved to the Mackay site from MAB in 2014). What has the transition to the Terrebonne site been like? Alison Leduc: As we’ve mentioned, it is an ongoing challenge not to feel too disconnected from the Mackay site and our colleagues from other MAB-Mackay programs. You have to prioritize your travel time, which is an adjustment. Before, you could go down a floor and talk to your colleague. Now you are no longer working in the same site, and meetings at the Mackay or any other CIUSSS site forces you to plan your travel and time accordingly. Hema Patel: We are starting to host meetings at our site. This allows us to give tours of the building for those who haven’t visited yet. Alison Leduc: It took a month for computers and telephones to be functional. To ensure everyone knew what was going on, we had daily morning meetings in the hall downstairs to brief the team of what was coming up that day. Staff members had to keep track of file notes on paper and create a ‘to fix’ list when a glitch came up. Our staff has high expectations of themselves, they want to do well for the clients and families. It is almost impossible to go through a move of this size and not feel the effects of getting used to your new routine, finding your boxes and things. 360: Did the move affect your partnership with the EMSB? Hema Patel: The feedback I have heard from the RPSS team is that the strength of our partnership with the education team has become stronger by completing the move together and continuing to work closely. The EMSB staff that managed the move project and the on-site caretaking staff have really embraced MAB-Mackay Rehabilitation Centre staff. For instance, when the schools were closed on January 23 for a snow day, the caretaking staff came to open the building so we could work that day. We are teams from two different organizations, but we work together as one. 360: Do you have any advice to other CIUSSS teams contemplating such a move? Alison Leduc: It’s never too early to start planning! Make sure that the planning is as bottom-up as it can be: it is important to have the input from all team members in the planning. The Innovation team has the broad picture of the CIUSSS, and they steered us to the right people and teams in the CIUSSS for all aspects of our move. Hema Patel: Visual tools really helped the RPSS team to see what was coming up, and what had already been done. We had a white board with a timeline of what had to be accomplished each month: what days were set aside for packing, where to find packing material, what to write on the box, and so on. Alison Leduc: A move is stressful in any context, but this move was also emotional for many staff. Some have been with the RPSS team for decades. For us, there is much history and memories at the Mackay site. Although the Terrebonne site is brand new and beautiful, the Mackay site had warmth and was home for us for so many years.